Philip Greenwood Sensei is the chief instructor and co-founder of Greenwood Aikido in Temecula, California as well as the president of the Nishikaze Aikido Society of America, a 501(c)(3) non-profit public charity and educational organization dedicated to spreading the work of notable aikido and iaido innovator and O-Sensei student Nishio Shoji (1927-2005), who was Greenwood’s instructor for many years. Greenwood Sensei has practiced aikido for 40 years and holds a 6th dan rank in the art in addition to a 5th dan rank in iaido and experience in Okinawan Kempo karate, judo, and jiu-jitsu. 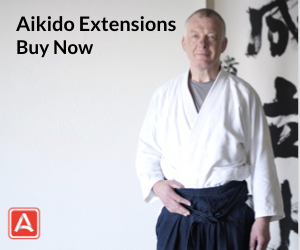 He started his aikido training at the Pasedena Aikikai, where he then taught as a primary instructor in the 1980s. For more information about Nishio Sensei’s life and work, please look here. The original transcript of this interview has been edited for clarity and brevity. 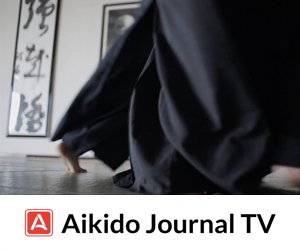 Aikido Journal (Josh Gold): Let’s talk a little bit about your thoughts on the spirit of aikido and the way aikido differs from a pure fighting system. What are the guiding principles that aikido practitioners should use to conduct themselves and how should aikido contribute to somebody’s overall well-being, life trajectory, and communities? Philip Greenwood: This is a really important question for me. It was an important question to Nishio Sensei as well, because in modern times we have popular arts like MMA in the picture, and there are people saying that aikido is becoming less relevant. I think it’s important to understand what aikido is versus what it’s not. When you look at a traditional martial art like aikido, it’s really about the development of the person and not just their fighting ability. I think aikido actually goes beyond even that. Aikido is really an expression of humanistic virtue. Right from the beginning, the priority in aikido is completely different from a sport or a combat art. To understand this approach, look at stoicism, especially thinkers like Marcus Aurelius or Epictetus. Philosophically, it’s really about valuing virtue — that virtue is its own reward rather than just focusing on winning, and it’s important to be true to one’s own nature regardless of the outcome of a conflict. I think in this respect, there are a lot of areas that aikido represents a real true expression of stoic practice. I think Nishio Sensei was really emphatic that aikido is a budo art and that aikido should express, shall we say, budo-ness. Part of this framework is about studying whether what you’re doing in aikido functions within the context of other martial arts. For example, in Nishio’s way of practice, every technique that we do has a striking element consisting of a series of atemi. We can take any technique and show a basic skeletal structure which is entirely built upon a series of strikes. If, say, we’re using a sword, there’s a specific series of cuts to understand, and there’s a series of strikes with a jo if you’re using a jo. Then, every technique contains a throwing component like judo. In every technique, we should be able to look at a te-waza [hand technique], a koshi-waza [hip technique] and an ashi-waza [foot/leg technique]. Every technique has a controlling element. There’s osae-waza [pinning techniques] built into everything. Aikido is really an expression of humanistic virtue. Right from the beginning, the priority in aikido is completely different from a sport or a combat art. In that way, you can look at aikido in terms of any martial art that you want to. An outside observer who saw these similarities might say, “Well, aikido kind of looks like many other martial arts,” and we do find similar techniques in other martial arts, i.e. a technique like kotegaeshi or nikyo is not unique to aikido. Likewise, if you’re studying the underlying principles of other martial arts, you should actually be able to find those same principles in your aikido. In other words, in aikido you don’t have permission to break the rules of good sound martial arts practice. Right, so there are strong similarities at the technical level between other martial arts and aikido. What are the differences? So, having said all of that, what you’re doing in aikido is basically reframing physical conflict in a unique way. Nishio Sensei even once wrote about this in a particular article. He said in aikido you’re “bending swords into plowshares,” which of course is a quote from the Bible from the book of Isaiah, and the meaning is that you’re taking something like a sword that was really traditionally meant for one, violent purpose and transforming it into something whose purpose is the opposite. For example, if you look at atemi and striking, in karate you hit the opponent hard. The method of winning is to disable the opponent with a strike. In aikido, our use of the strikes should actually be different. In aikido, you don’t use a strike to injure the opponent. The atemi is just to stop the opponent’s initiative — their will to attack — and to control the person without endangering them. If you’re coming from a karate perspective or a more striking arts perspective to aikido, it would be useful to think of striking in these terms for your aikido practice instead of what you’re used to. Rather than just hitting people to break them or hurt them, you can use strikes as a way to mitigate the situation and, in Nishio Sensei’s terms, help build a place of mutual coexistence. While aikido is relatively young for a traditional Japanese martial art, the philosophical influence goes both ways. 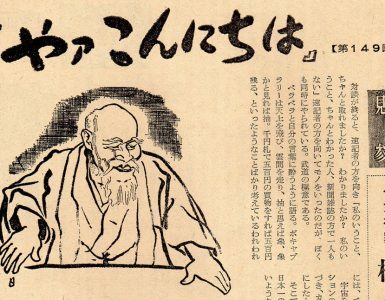 Nishio Sensei felt that in aikido we should learn from other martial arts, but it’s also the role of aikido to teach other martial arts what he described as true budo life, meaning showing people a deeper way to study things that they were already studying. Nishio Sensei would often talk about aikido as being a budo of forgiveness. Is that part of it? Yurusu can even mean to tolerate someone. If somebody is annoying you, you don’t necessarily have to do anything about it. Sometimes you can just tolerate the person. It’s not always about actively confronting the situation. I think if you go back to this idea of stoicism, Marcus Aurelius would say, “Teach people, but if you can’t teach them, then tolerate them.” This is very much at the heart of this whole concept of “budo of forgiveness.” There was this feeling of acceptance and leading and tolerating when it comes to other people. It’s a beautiful concept and it actually became the title of the book Nishio Sensei wrote that was published by Aikido Journal years ago. Stan Pranin Sensei put it together, I think. 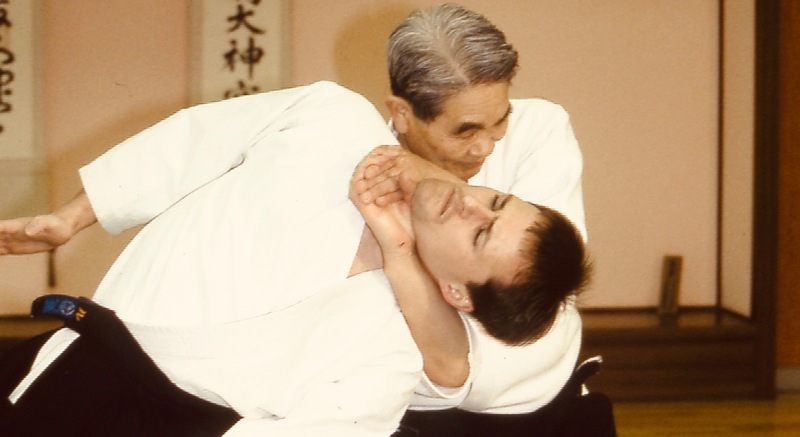 Shoji Nishio performs a choke technique. From Aikido Journal’s instructional course on Nishio’s aikido system. Right, exactly — the title was Yurusu Budo. About this concept of yurusu, Nishio Sensei would say, well, the first thing is that you have to acknowledge the other person as a human being. Traditionally, martial arts did not. At the point that a person became your enemy, they were sort of not a person anymore. They were just something to cut down. if you’re studying the underlying principles of other martial arts, you should actually be able to find those same principles in your aikido. In other words, in aikido you don’t have permission to break the rules of good sound martial arts practice. 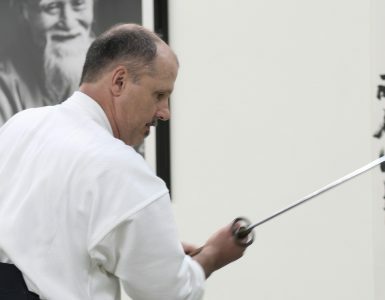 In traditional martial arts, if you practice with a sword, you need to cut with it. They’d consider not cutting to be practicing a lie. But Nishio Sensei said no, you don’t cut the person with the sword. Actually, the little saying that he had sometimes was “the true place for the sword is in the saya [scabbard].” As you do your technique, you should be able to return your sword to the saya without any blood on it. Actually, one time he joked a little bit, and he said something like, “When you put the blade on the back of the person, draw just a little blood but only as much as you can clean up with a tissue.” So don’t hurt them badly, but a little bit is all right that way. I think we need to understand, too, that this style of martial arts training is not completely without effect. In other words, you definitely would feel the technique from Nishio Sensei, but it wasn’t with malice. But it wasn’t about maximizing damage to the opponent. No, it’s the opposite of that. Nishio Sensei would say that in the past budo was sort of based on a concept of taking, and, ultimately, that led to taking somebody’s life. It didn’t allow you to acknowledge or forgive the other person. It was just about cutting them down. Once someone was “the enemy,” then any action that you took against that person was justifiable. You actually see this attitude in Japanese history — and not only Japanese history, but all history. You see it in American history; once we decided that certain people weren’t really people, then we could do whatever we wanted to them, and the results were horrifying: the treatment of Native American peoples, the treatment of other minorities, treatment of slaves, all of these things. We have our own sordid history. Nishio Sensei pointed to the history of the samurai and found it rather reprehensible. He did not see people like Miyamoto Musashi (宮本 武蔵, c. 1584 – June 13, 1645) as being a great hero. He saw them as being the worst kind of human being. He concluded it was our job in aikido not just to figure out a new self-defense method. 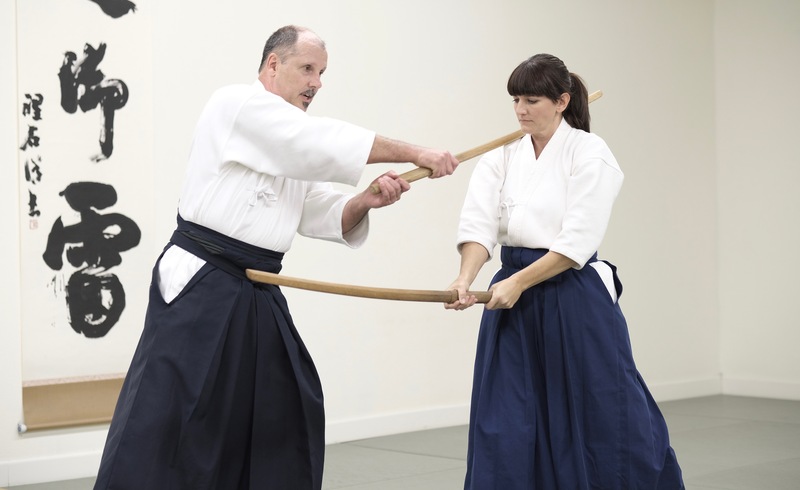 I think it’s underrating aikido in a huge way when we go immediately to saying, “Well, how can we do better from a purely self-defense perspective?” If you need a self-defense class, great, go take a self-defense class. 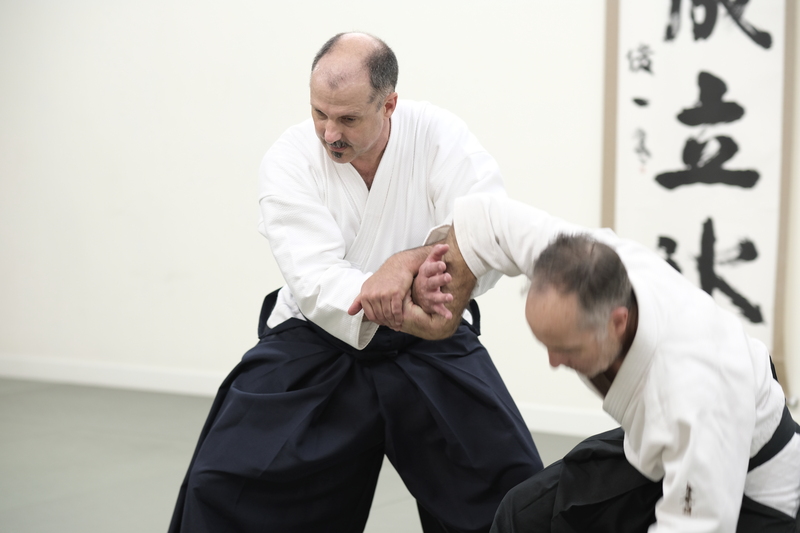 It’s not really the purpose of aikido just to do that thing; it’s a much broader philosophical purpose that aikido fulfills within the martial arts world. Some people get it and some people don’t. Some people just think, “Well, if you can’t take them down and punch them out, then what good is this thing? Martial arts should be able to hurt people, end of story.” That’s not true at all. Roy Harris [the teacher of jiu-jitsu expert Roy Dean] says that there are many other purposes for a martial art besides being a sport or besides being a combat form. I think that’s very compelling. You spoke about some people not really getting it — how would you summarize what you think aikido’s place or role is in the larger martial arts world and how you would communicate it to others? Yeah, I think this is a difficult thing to figure out because you have a sort of zeitgeist in the world right now when it comes to martial arts, where if you say you do a martial art, people think of a certain thing like MMA. It wasn’t always like that, though. When I first got into martial arts, in the ’70s, you would watch Kung Fu on TV or Bruce Lee movies. There was always the sense that martial arts were a way of life, a philosophical endeavor. I have some old Bruce Lee books and one of them is titled Chinese Gung Fu: The Philosophical Art of Self-Defense. That was always a part of it. When we watched the show Kung Fu with David Carradine, it was about the philosophy of what was happening there. It wasn’t just the fact that it was super cool that he could beat up all these guys at one time. One side effect of the philosophical approach is that I think there has to be a sort of maturity that develops in a person before starting on that path. Nishio Sensei felt like young kids probably couldn’t really understand aikido, but they could do it from a gymnastics standpoint. 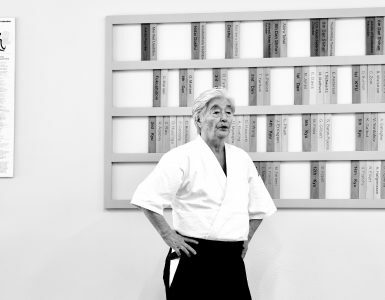 At one point he was talking to Tomiki Sensei and ultimately Tomiki developed his Tomiki aikido which was kind of a competitive thing so younger children could have a sense of accomplishment. But I think for adults to get to a place where they appreciate aikido, you have to first engage them at the level of its principles and of its spirit and its philosophy. Nishio Sensei pointed to the history of the samurai and found it rather reprehensible. He did not see people like Miyamoto Musashi as being a great hero. He saw them as being the worst kind of human being. He concluded it was our job in aikido not just to figure out a new self-defense method, but a new approach to conflict. Everybody that I’ve had as a good long-term student that stayed with it came to the art for those kinds of reasons. The people that come looking for a better way to bend somebody’s wrist don’t tend to be good students. So, when we talk to people who aren’t sure about aikido’s relevance, I think we need to talk about principles. We need to talk about philosophy. We need to get people to understand the spirit of the art so that they can have an idea of why we’re doing what we’re doing. I think, in this respect, we’ve got to get to the point where we’re talking about aikido as principle and aikido as philosophy and aikido as a way of life for people. It may be that we’re not going to get through to the people that just want to be a thug, but I don’t think those are the people you wanted anyway. The whole difficulty is that people that become interested in martial arts today very often just want to learn to hurt people. I think it’s true that people interested in martial arts often come in either with the goal of wanting to learn to dominate in physical combat or to be able to defend themselves. Many times through training, though, they’ll start to seek, and find deeper levels in their practice. I think that’s an area where aikido shines. Yeah. I’ve had a few occasions — including one very recently — where people who’ve trained in other martial arts visit the dojo and they sort of want to challenge me. One was a judo guy a while back, and then more recently, another fellow was from some other martial art. I guess they want to know that aikido “works” in a physical combat situation and I get that. You want to know that you’re not wasting your time with something before you start training in it. When these people ask for this kind of interaction, I have to “handle” them in a physical sense and then I don’t feel good about it afterward because I don’t think that’s really what the purpose of aikido training is about, but I also know that’s the only thing that they’ll really understand at that moment. This does work out well sometimes. In fact, I’ve got a student who has been with me for quite a long time who was actually a karate student of Fumio Demura. Nishio Sensei felt that in aikido we should learn from other martial arts, but it’s also the role of aikido to teach other martial arts what he described as true budo life, meaning showing people a deeper way to study things that they were already studying. Can we talk a little bit about the future of aikido, especially through the lens of Nishio Sensei’s philosophy? One of the things that I really admired about Nishio Sensei is that he was very flexible in terms of defining what aikido is and how it can evolve in the future. He himself was very willing to pull in concepts from other martial arts or incorporate new ideas, but at the same time he had some pretty firm ideas about the core principles or fundamentals of what was incorporated. Philip Greenwood with Heather Greenwood. For example, you really have to decide whether or not you’re serving power or serving virtue, in the sense of your guiding principle for practice. What I mean is, if you’re primarily aiming to develop power, then clearly going to an MMA dojo and just learning how to win in that particular setting is the right answer for the question of “How do I physically dominate other people?” The structure of practice will also be different — you should train on a few techniques that you’re really good at and develop a ground game, a standing game, a striking game, etc. You should also be physically conditioned to be able to take a lot of punishment. If you’re serving power in that sense, that’s the right answer. But listening to someone like [UFC Hall of Famer and MMA fighter] Bas Rutten look back on his fighting career, he says he’s realized now that some of the achievements in his career weren’t that fulfilling — it was more about like seeking the approval of his peers. He’s honest about it. In the stoic sense of virtue that parallels aikido’s, how can you call that a virtue? In that sense, it shouldn’t be about fame or money or power or success or recognition. Virtue is its own reward. If you’re acting for the good of others, and you’re acting for the good of society, and you’re putting those needs before your own personal gain, then that’s an expression of aikido’s ideals. Aikido is really an expression of how an ideal society should be embodied within the context of a martial art. It doesn’t really matter sometimes whether you win or you lose. If you look at somebody like Martin Luther King, Jr. and his particular stand on violence and how he went about promoting racial equality in this country, how would his cause had been served had he said, “Well, we need to defend ourselves and carry guns and shoot back when they shoot at us”? If he had advocated some sort of violent response — which, some might say, would have been justified — how far back would he have set the movement against racial discrimination in America? The point is not that he was perfect, but rather what was a practical answer for him personally in terms of his own safety and survival was not a practical answer in terms of his cause. Nishio Sensei even talked about this. He said that when you look at the history of Western knights, that history is about — in a lot of cases — fighting for individual honor; today, this is really what underpins the notion of Western sports. He said that the traditional Japanese way is never that a person fights for themselves; you wouldn’t go to a samurai’s house and see a bunch of trophies on their wall. That would be a deplorable example of a true samurai. Aikido is really an expression of how an ideal society should be embodied within the context of a martial art. In reality, the samurai were fighting for their country or their community or their family. Nishio Sensei would say that when we get together and decide as a community what the right way to be is, this is civilization, and that way we can end violence. If people fight just for themselves, you’re never going to have any end to this. It’s just ongoing perpetual violence. Aikido’s mindset is effectively a community consciousness of martial art rather than individual competition. As soon as you think about competing with another person and going into the ring, even if you manage to wrangle a kotegaeshi on somebody in the ring, please don’t call that aikido. Just because you bend their wrist backward and they fall down, aikido did not suddenly happen. Aikido is a much deeper view of the world than any individual interaction. Very nice article. I could really relate to his references to the Kung Fu series and Bruce Lee movies showing a more philosophical approve to the study of martial arts. I still love Bruce Lee’s line in Enter the Dragon when confronted with the bully on the trip to the island, “it’s the art of fighting without fighting” and then coaxes the bully into the small boat and leaves him there. Thereby ending the fight without fighting! Thank you Jim. That was such an iconic scene with Bruce Lee. As it suggests, a broader mind set can allow us to place the ego aside and discover what really constitutes “winning” in the larger sense. I loved this interview. It is perhaps one of the best articulated views of aikido I have come across in the last couple of years. 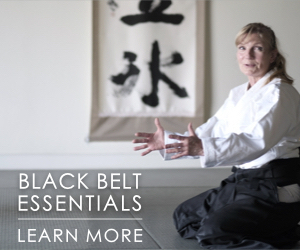 A well-defined understanding of aikido, likening it to Stoicism but with a samurai twist. The samurai, as Philip points out, were always committed to the survival and social well-being of a particular group. The martial arts were thus never designed to be pursuits solely for the self but pursuits for the fulfillment of social virtues. Training merely for self-gratification, self-adulation, or even peer approval, or point-scoring, like MMA and other martial sports do today would have been anathema. I wrote about this kind of thing in my upcoming ebook and I am glad at least one other person takes a stance that’s in complete agreement with mine..! Thank you Keni. Your comment is right on. As I suggested in the interview, my impression from Nishio Sensei is that aikido is an expression of an ideal society, an ideal way for humans to conduct themselves and it serves as a kind of redemption of the frequently inhumane and sometimes criminal acts that martial practices represented in the past. The difference between aikido and other locking or throwing arts should be the use of aiki in the set up and application of the moves rather than leverage or sheer muscle strength/mass. Thank you Aaron. While I can appreciate the value of both effective power generation as well as effective technique I can’t really agree that aikido is entirely defined by either of these. It’s my view that aikido is ultimately defined by its intended role within the martial art world and in society. It is within that general context that we pursue the art in a way that is most meaningful and effective to that end. I love the quote ” in aikido you don’t have permission to break the rules of good sound martial arts practice.” That absolutely sums up nishio’s ever changing/evolving and to the point yurusu budo. 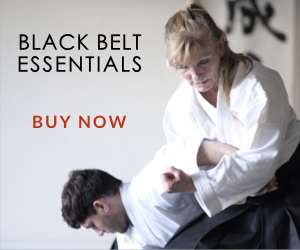 Philip greenwood apperers to have mastered nishio’s smooth entry and accurate application of budo principles, coupled with the essential study of weapons that tie it all together. Stanley pranin saw the genius of shoji nishio but for many of us younger aikidoka we just missed out on the chance of meeting the person saito described as the future of aikido, Philip along with nishio’s videos may give future generations the essential martial skills to take aiki into the modern age and therefore retain it’s ability to be more than just a fighting system. Thank you Richard for your kind words. I do think that Nishio Sensei offered some very important insights in terms of technique, retaining aikido’s budo nature, and in terms of his more contemporary expression of aikido’s role in society. I’m certainly not trying to step into Nishio Sensei’s shoes, but I’m just restating his teaching through my own experience and my own lens. Interesting that through this interview Nishio-sensei’s Aikido sounds full of Christian values like love for your brethren, the value of forgiveness, etc. Pretty interesting also was the fact that Nishio-sensei was using a quote from the Bible. Sure a powerful one that relates to aikido. Note that I’m not talking about this to bring some religiousness or rite to aïkido or to Nishio-sensei. I’m just pointing similarities and links. 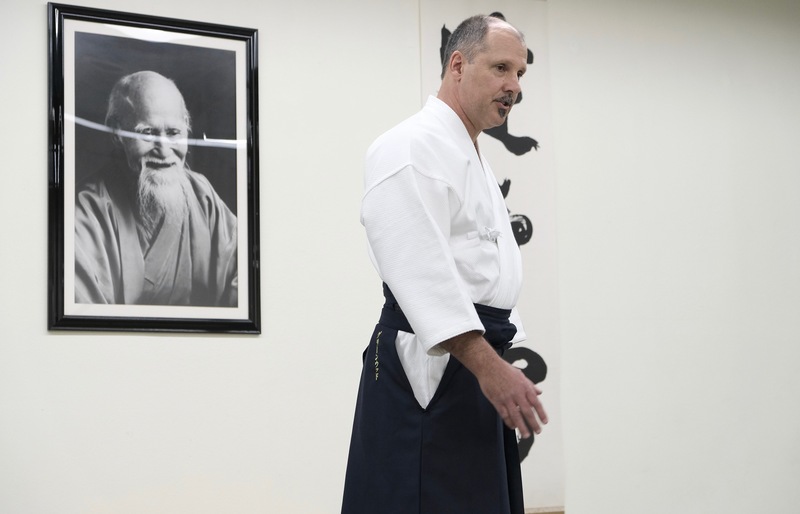 Nishio Sensei encouraged people to look to their own culture and roots to find their own understanding of aikido. I suspect his biblical reference was simply pointing to something outside Japanese tradition to illustrate that ideas of redemption, forgiveness and transformation can be found everywhere. I most definitely don’t want to suggest that aikido should be seen as religious. I’m not a Christian and I’m not religious so I have no interest in imbuing aikido with religious or spiritual overtones. I actually think it’s a disservice to the art to do that. One can be religious or not and still practice aikido. For me, aikido encourages us to reflect on our own thinking and actions and strive toward an elevated form of human interaction. By practicing with a sense of mutual acknowledgment, affection and compassion we each trace a path toward a better human society. Important questions and excellent answers. I am encouraging all of my students and colleagues to read it carefully. a technique like kotegaeshi or nikyo is not unique to aikido? Both those techniques can be found in many other martial arts. Variations of almost all techniques can be found across systems. Thank you for posting this, it was fertile ground for an analysis of one of the quotes about what aikido really is. And thank you to Mark Twain for the reduction of the fact that I didn’t have time to write a short letter, so I posted the shadows of the analysis on the blog instead of here in a comment.